It is officially summertime, and one of my favorite summer treats are pineapples. While snacking on pineapples I am often compelled to share a slice or two with my furry companion, but hesitate in fear that he may not be able to stomach it, for one reason or another. I decided to conduct a little research, and to decide once and for all if pineapples are safe for canine consumption. So is it safe to feed my canine pineapple (Ananas comosus)? Raw pineapple, in moderation, is a welcome addition to any dog’s diet! (http://www.mybonesandbiscuits.com/can-dogs-eat-pineapple) Simply take a raw pineapple (organic, if at all possible in order to avoid nasty pesticides), remove the spiky exterior as well as the core, and then slice the rest into bite size pieces. Given in moderation, pineapple can be used as a tool to provide several invaluable benefits to your pet, so lets dive in to some of the best reasons to give your dog pineapple. We’ve all, at one point or another, had dogs that dined on their own or another animals feces, and wondered what exactly the appeal was. The eating of a dog’s own or another’s excrements is actually a documented condition known as coprophagia. There are many different causes of coprophagia, which may be health related or behavioral. When addressing coprophagia, it is always good to consult your vet first in order to rule out any health concerns associated with dining on doggie-doo. If your dog’s coprophagia is a behavioral issue, and not health related, then pineapple can be used as an excellent tool to help rid your pup of the nasty habit. Giving your dog a slice or two in their food or around mealtime will cause their excrement to smell unattractive, and effectively deter their interest in consuming it. Bromelain is a mixture of enzymes found in pineapples, and is hailed by many as a natural cure to inflammation, arthritis, and even cancer. Bromelain has an added importance to your dog, as it will also help increase their protein absorption, a vital process for all dogs. Bromelain is lost in the pineapple canning process, so be sure to always give your pup fresh, raw pineapple in order to receive the full nutritional benefits. Pineapple’s delicious nature makes it a perfect reward to your dog for a job well done. Keep on hand a bag of small, bite size pieces to give your dog when they obey a command or to promote good behaviors. Praise is always a more powerful learning tool than punishment, and your dog will absolutely love the sweet snacks! 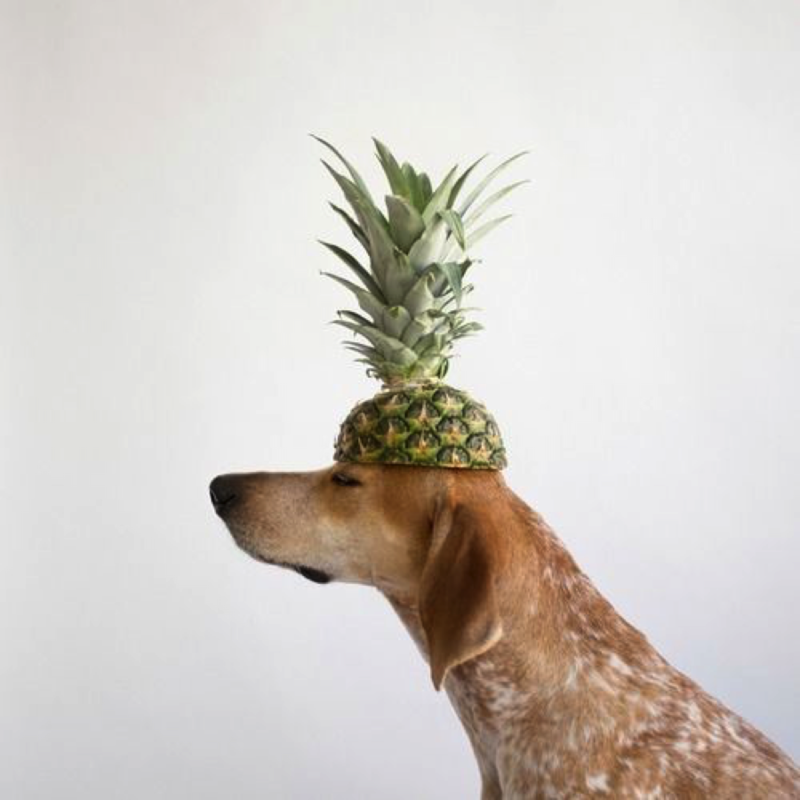 A few slices of pineapple can be given to your dog each day simply because it is a nutritious addition to their diet. Pineapple is an excellent source of vitamin C, B6, thiamin, and folate. The snack is also a good source of minerals manganese, copper, potassium, magnesium, and iron. Pineapple is cholesterol free, and high in fiber. In other words, pineapple is a nutrient dense snack that will assist in improving digestion, immune functions, and in turn the overall health of both you and your dog! Pineapple has a high concentration of sugar, which is something to keep in mind, even though it is natural fructose and not the processed sugars that lead to rampant weight gain and diabetes. Dog’s digestive tracts have issues processing large amounts of sugar, so more than a few slices of pineapple a day could lead to cases of diarrhea. Pineapple should always be enjoyed raw and ripe in order to realize its full nutritional benefits. If frozen (an extremely refreshing summer treat) or refrigerated, pineapple slices retain their full nutritional value for around six to seven days. Avoid canned or store-bought frozen pineapple, as the bromelain along with many other nutrients are absent. Canned pineapple is often packaged with sugary syrup that will not agree well with your dog’s stomach, so stick to fresh. Always keep in mind that every dog’s stomach is different and, like humans, can be susceptible to an assortment of food allergies and sensitivities. When trying any new foods, it is best to start with a small amount and to wait and see if there are any unpleasant reactions before continuing consumption. Remember that moderation is paramount to the enjoyment of any nutritious snack, and to always consult your veterinarian before making dramatic changes to your dogs’ diet. Cheers to you and your dog’s pineapple filled summer!